The Kingdom of Thailand, formerly known as Siam and located in Southeast Asia, has always been a welcoming place for Jews. Despite recent terror threats, thousands of Israelis travel to Thailand annually and there is a strong orthodox presence thanks to Chabad in many of the large cities. Today the permanent Jewish population in Thailand is estimated to be between 700 and 1,000, with most Jews living in Bangkok. Thailand, a country 95% Buddhist, has always been a nation that stood for religious tolerance. Jewish settlers have always been welcomed in Thailand and free to practice their own customs. Spanish missionaries first reported the presence of Jewish merchants in Siam in 1601, in the Kingdom of Ayuthaya. These Jews were reported to have established a synagogue and to be living “zealous in the Law of Moses.” In 1683, Abraham Navarro, the first documented Jew to live in Thailand, arrived as an interpreter for the English East India Company. It is also known that Navarro visited the Court of King Narai in Lopburi. During the 1800s, most Jews who arrived in Thailand came as merchants traveling throughout the East. In 1890, a few European families settled in Bangkok during the reign of King Chulalongkorn (Rama V). Among these families were the Rosenbergs who developed the first modern hotels in Bangkok, including the Europe Hotel. Russian Jews fleeing Soviet discrimination arrived in Thailand in the 1920s from Harbin. Among these Russian Jews, was Haim Gerson, who was a very prominent businessman in Thailand and led the Jewish community for several decades. In the 1930s, approximately 120 German Jews, escaping Nazism, settled in Thailand. However, most of these immigrants left after World War II. During World War II, several Jewish families arrived from Syria and Lebanon. Amid the Syrian immigrants was Isaac Djemal, who later served as the President of the Jewish community. Selim Eubhani, Djemal’s nephew, would also serve as the community’s lay leader and conduct religious services. During the war, nearly 150 Allied Jews were imprisoned in the Japanese POW camp in Kanchanburi. Among the prisoners was a rabbi who would lead services. The Jewish population began to thrive in the 1950s and 60s with the arrival of Jews from America, Iraq, Afghanistan, and Iran. In 1964, the Jewish Community of Thailand was established. The Vietnam War in the 70s brought an influx of Jewish American soldiers to Thailand. Numerous Israeli families also immigrated to Thailand during the 1970s, in search of business opportunities and adventure. These Israelis came to Thailand to work mainly in the gem and jewelry trade. Many Israeli businesses were opened in Thailand in trading and advising the Thai government on agricultural issues. Joint projects introduced Thailand to new methods of irrigation and agricultural products suitable to the climate in Thailand. It was also during this period that the Jewish community instituted a religious school, weekly services and social events. Today, Thai Jewry numbers an estimated 700-1,000 inhabitants and continues to grow. Most Jews in Thailand are of European and Asian origin, with a limited number being Thai nationality. There are a mixture of Sephardim from Syria, Lebanon, and Israel, as well as Ashkenazim from Europe, America, and Shanghai. Almost all of the Jews are involved in the trading industry and production of precious jewelry. Virtually all the Jews in Thailand live in Bangkok, the capital. There are three synagogues in Bangkok (Ashkenazic and Sephardic synagogues and a Chabad House) as well as Chabad Houses in Chiang Mai, Phuket and Koh Samui. All four Chabad Houses provide regular Shabbat prayer services (Chabad Bangkok as weekly services as well) and they all contain kosher restaurants. The Ashkenazic synagogue, Beth Elisheva, was consecrated in 1979. Elizabeth Rosenberg Zerner (Thai born daughter of the first Jewish citizens, the Rosenbergs) donated the piece of property for the establishment of an Ashkenazic synagogue. The synagogue was named Beth Elisheva in honor of Elizabeth Zerner. The synagogue also maintains the Jewish Community of Thailand Community Centre, and a mikveh. During the community presidency of Ebrahim Kashani, the synagogue consecrated the first Jewish cemetery in Thailand. 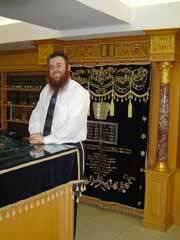 The Ashkenazic synagogue maintains a Sunday and nursery school, as well as a permanent rabbi, Rabbi Yosef Kantor. Rabbi Kantor arrived in Thailand in 1993, along with his wife Nechama Dina. Adult classes on Judaism are available in both Hebrew and English. The English classes are held every other week after a communal barbecue. There are several restaurants and markets where kosher food is available. The Sephardic synagogue, Even Chen, was the first official congregation established in the 1970s. The synagogue, club and kosher restaurant attached to the synagogue are also under the supervision of Rabbi Kantor. The synagogue provides daily morning and evening minyans. There are also regular Friday evening and Shabbat morning, afternoon, and evening services. 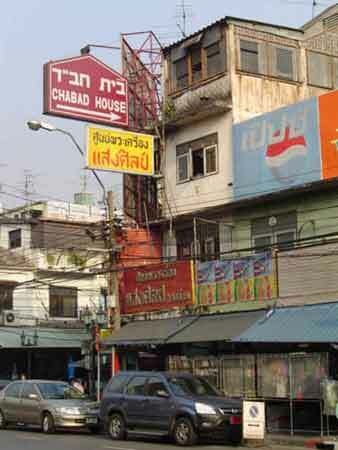 The Bangkok Chabad House, Ohr Menachem, was consecrated in 1995. It is a popular location for travelers, and well-known for its community seders and holiday celebrations. Hundreds of tourists, from all over the world, have come to Thailand to celebrate religious holidays. This Chabad House is visited by one of the largest numbers of Jewish backpacking tourists in the world, especially Jews from Israel. Services are led by Rabbi Nechamya Wilhelm. In 2009, the Bangkok Chabad House had the second largest Passover seder ever recorded, with more than 1,000 people attending the service and meal. The Israeli Embassy is located in Bangkok, as both nations share full diplomatic relations. Formal diplomatic relations between the two countries were established on June 23, 1954, and were strengthened with the opening of the Embassy of Israel in Bangkok in 1958 and of the Royal Thai Embassy in Tel Aviv in 1996. The two countries have nurtured a strong bond of friendship, mutual understanding, and bilateral cooperation in the public sphere, as well as at a people-to-people level in various fields of endeavor including education, agriculture, public health and economy. The bilateral relations were demonstrated notably by a number a memorable and historical state visits of Thai dignitaries to Israel, including the Crown Prince Vajiralongkorn and Princess Maha Chakri Sirindhorn. These gestures of goodwill were reciprocated by visits to Thailand by Israeli prominent public figures such as Israel Defence Force Chief of Staff Mr. Yitzhak Rabin and Mr. Abba Eban. Israel, which confronts complex modern social and economic realities, has always perceived Thailand as a nation sharing the challenge of alleviating such universal problems as drought, poverty and the need for improved rural development. The two nations have worked on the advancement of both countries’ primary education, reforestation, irrigation techniques and fish farming. A large number of high-level Thai officials have visited Israel on study tours and training courses extended by MASHAV, the Israeli agency for international cooperation. Since the beginning of MASHAV's activity in Thailand in the mid-1960's, more than 2,000 Thai professionals have participated in courses in Israel, mainly in agriculture and education. A large number of experts and trainees have also participated in Mashav on-site courses in Thailand. Dozens of Thai schools have built their educational curriculum based on Israeli experience and know-how. In January 2004, the long-standing, historic cooperation with Khon Kaen University came again into expression when HRH Princess Maha Chakri Sirindhorn inaugurated a jointly developed Israeli-Thai agro-technology experimental farm for irrigation of high value crops on its grounds. The peoples of Thailand and Israel are very familiar to each other. In 2003, Thailand hosted some 100,000 Israeli tourists who chose it as their prime holiday destination. A significant number of Thai workers are employed in Israel’s agricultural sector. A growing number of Thai agriculture college students attend innovative training programs in Israel, which were initiated in 1997 as part of a unique joint project under the patronage of the Thai Ministry of Education. The IDF received it's first Thai recruit during it's 2017 summer volunteer program. Born and raised in Bangkok, Thailand, Marissa Avram's father is Israeli and her mother is Thai. The IDF also welcomed it's first recruit from Honduras during the same session. The Foundation had its beginning in 1972 when a group of 13 former Thai students and trainees in Israel gathered at the First Hotel in Bangkok and decided to form a Thai-Israel Friendship Group. The main objective of the group was to create a bond of friendship within a nucleus of those who have benefited from studying and training in Israel. Members of the foundation came from those who had trained and studied in various fields, such as agriculture, medicine, education, early childhood education, rural development, water resources and irrigation, and labor development. Membership of the group expanded and activities to put the members’ knowledge and experience to good use were initiated with close cooperation and support from the Israel Embassy on Thailand. While the group’s activities cover a wide range of development and cultural topics, the main thrust has been in the field of education, with emphasis on early childhood education. A training certificate course was successfully organized in 1976 for teachers and educators on the techniques of early childhood education, pre-school childhood development, and teaching aids. The first study tour was organized for 35 Thai teachers to receive training at the Golda Meir Mount Carmel International Training Center (MCTC) in 1983. In 1984, the group became officially registered as a nonprofit, non-governmental Foundation and received a donation of a 5 ½ rai plot of land from a benefactor none other than the Foundation’s own Chairperson of the Early Childhood Education Group, Archan Chawiwan Chungchareon. The plot is intended by her for future establishment of a long dreamed of demonstration school project modeled on the Israeli early childhood education system. One year later the Foundation had the good fortune to be gracious taken under the royal patronage of H.R.H. Princess Mahachakri Sirindhorn on November 21, 1985. Since its establishment the TIFF has initiated dozens of cultural activities all over Thailand. 121 Soi Sai, Nam Thip 2, (Soi 22) Sukhumvit Rd. Daily services, Friday eve. Tel. (2) 258-2195.